Well hello to you my reader chums! July is another one of those months that has swept by super quickly, but may I add (as the typical British person I am), haven’t we been really lucky with the weather? July has been a prime summer month and I’ve been enjoying soaking up the sunshine and dabbling into a few new products. I used to be obsessed with BB cream especially in the summer months, however have fallen out of the habit of using it. As the warmer weather has been intense this past month, I went on the hunt for a suitable BB cream. Maybelline’s version used to be my go to, however they discontinued it a while back. After a browse in Superdrug, I came across their own branded BB cream and thought I’d give it a go, as I’ve heard many things about the own-branded products. The BB cream didn’t disappoint: it gave that tinted bit of coverage, a beautiful summer glow and an overall natural look. If you’re looking for a product that is the perfect summer time makeup base, this is for you. At the same time of purchasing the BB cream, I bought this cleanser as it was buy one get one free on Superdrug’s own goods. I’ve been meaning to buy a hot cloth cleanser for a while now, and once using this, I can see I was missing out. This cleanser is one of the gentlest products I’ve used on my skin. It has a lovely sweet scent that isn’t too overwhelming and the texture is really thick. Upon application, the cleanser feels incredibly creamy and soft on the skin, blending in well. Once I washed it off, my skin felt super clean and fresh. Although I can’t compare it to the Liz Earle version, this cleanser feels like it should have a hefty price tag and I’d really recommend it. I love a deep conditioning treatment, as it’s essentially a face mask for your hair – perfect as part of a pamper night. I’ve heard a lot of good reviews about Garnier’s ultimate blends range that I was excited to give it a go. The conditioning treatment is really thick and has the most delicious, lingering scent to it. It left my hair feeling really silky smooth and the sweet scent stayed in all day long. 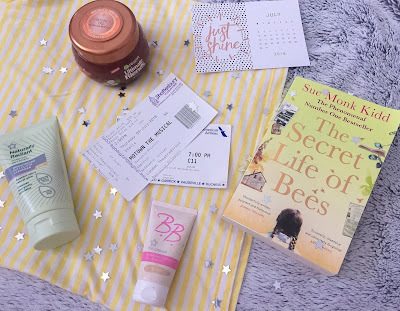 I’ve rekindled my love of books lately and absolutely adored The Secret Life of Bees. Even though I technically finished it at the beginning of the month, I still wanted to include it in case you haven’t read my book review because I loved it that much. It’s one of those warm-hearted books which have a tragedy in the storyline but it leads to something positive and uplifting. 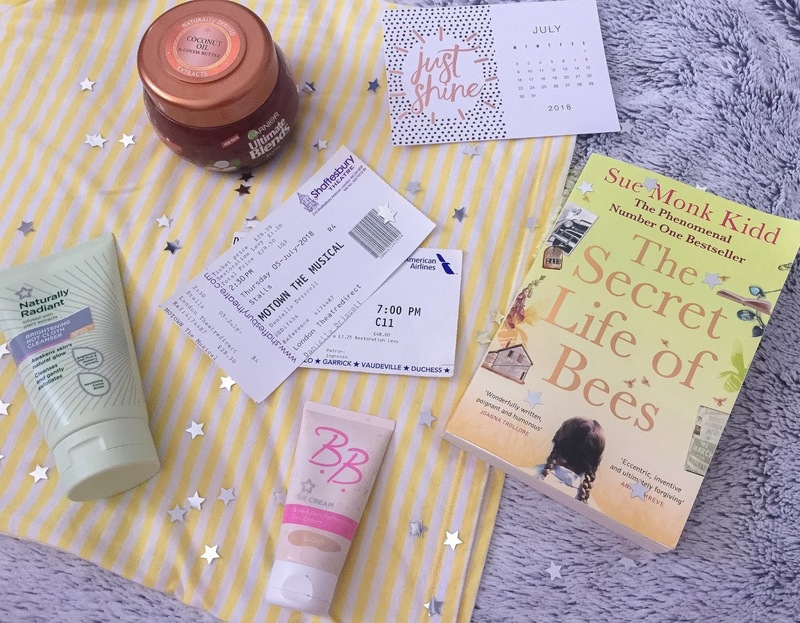 I loved the whole theme of the story and how bees played their part – and the characters really formed a place in my heart. It's certainly a universal read. It’s no secret that I love a theatre show and in July, I was lucky to grace London’s west end twice. 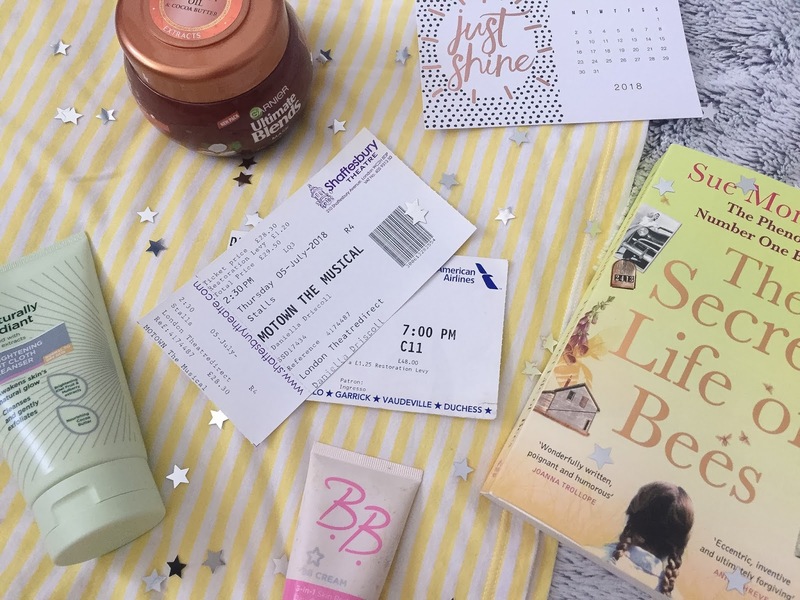 Firstly I went to see MoTown the musical for my mum’s birthday and then my best friend treated me to tickets to The Play that Goes Wrong for my birthday. Although the shows are two different types of genres, they were absolutely phenomenal in their own ways. MoTown has all the fun-loving music and a really interesting storyline, and The Play that Goes Wrong was the funniest show I’ve ever watched. It was that slapstick type of comedy that left you on the edge of your seat laughing. If you’re heading up to the west end any time soon, I’d highly recommend both of these shows. I hope you enjoyed my July favourites. Which products have you loved this month? I would loove to see The Play That Goes Wrong! I may plan my London trip around that, hm. Lovely post, Della!